I’ve been fascinated with piggy banks ever since I was kid, when I deposited my weekly pocket money into a black porcelain pig with white polka dots. I loved shaking that pig and hearing the coins rattle around – although retrieving them was always a challenge. You had to turn the pig upside down, peer in the little slot, and hook onto a single coin with a knitting needle until you got it upended and balanced precisely to slide out of the slot. 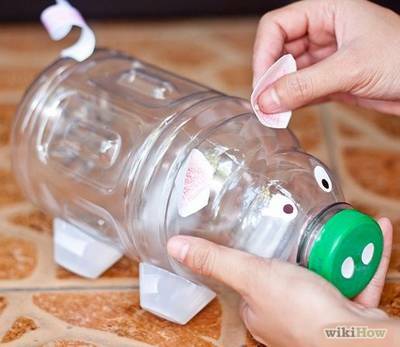 This plastic bottle piggy has several advantages. One, you can see through to the booty inside. Two, if you use a bottle with a big enough lid, you can let the coins out that way. 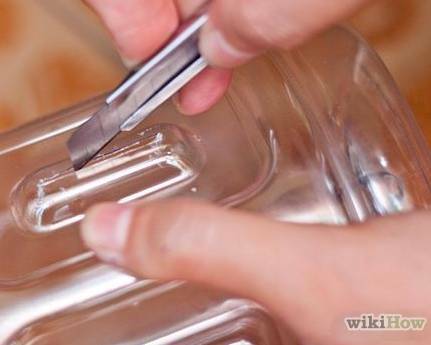 And three, if the lid is too small, and you’re desperate, you can cut through the bottle itself. But lets suppose, for now, you’re making a piggy bank which will hold all your money for a long time while you save up for something really special. Wash, rinse and dry the bottle and replace the cap. (Please note: only adults should do this step as it involves a knife or scissors, and requires applying pressure to an unstable object. Please exercise caution). Turn the bottle sideways and cut a slot midway down of an appropriate size for the coins in your country. This can be a bit tricky, as some bottle plastics are brittle and prone to cracking. It sometimes helps to warm the bottle a little bit with a hair dryer first, before attempting to cut, as this makes the plastic more pliable and less liable to crack or split as you work. 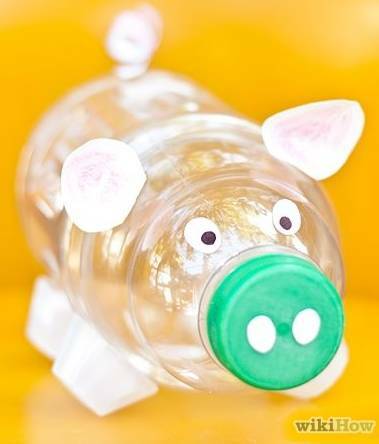 Give your bottle piggy bank some legs by cutting four sections from an egg carton and either gluing or taping them in place. Other recyclable objects may also work as legs if you don’t have an egg carton: consider wine bottle corks, or four matching screw-top jar lids. Cut two triangular shapes from paper, card, felt or craft foam. Color these pink, if you wish, for the pig’s ears. Glue them in place, as shown, at the top of the pig’s head. Cut a circular spiral from paper, card, felt or craft foam and pull it out to make a corkscrew type of tail. Glue the tail to the bottom of the bottle. Now paint two small white circles for the pig’s eyes and let the paint dry. Add a dot of black paint or black marker to make eye’s pupils. Paint two white ovals on the bottle lid to make the pig’s snout and let dry. Adapted from WikiHow under Creative Commons License.